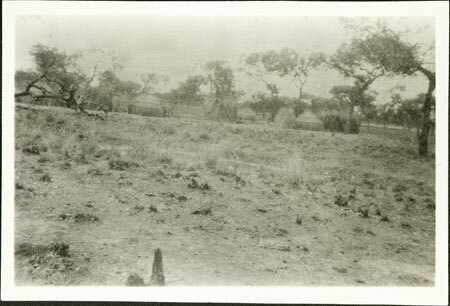 Looking towards a dry season cattle camp (wec) with small beehive-shaped huts visible as well as windbreaks. A group of boys can be seen climbing a dead tree to the left. An image showing a dry season forest pool from the same film was published suggesting a location in Lou country. Note on print reverse ms pencil - "32/7 41 141 "
Morton, Chris. "Nuer cattle camp " Southern Sudan Project (in development). 03 Jan. 2006. Pitt Rivers Museum. <http://southernsudan.prm.ox.ac.uk/details/1998.346.141.2/>.